Can you name the two iconic comic book heroes known for being ‘boy scouts’? They even have similar colored uniforms if you need a hint. Have an answer yet? The first is Superman. The second is Captain America. I prefer Batman to Superman. 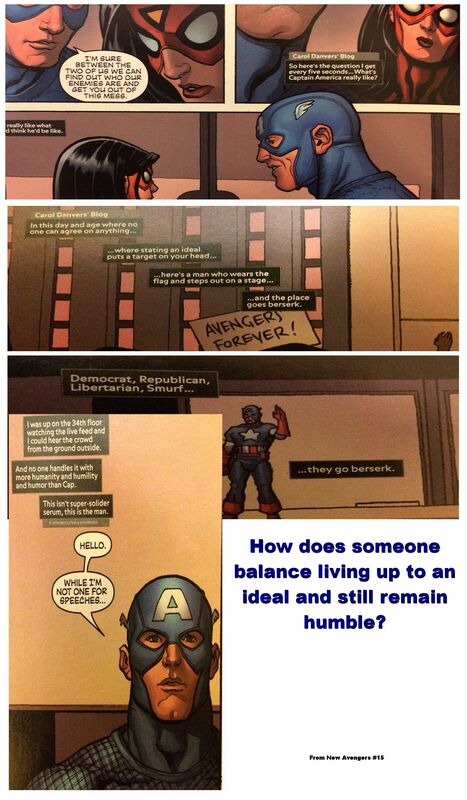 I do find myself identifying more with Cap as time goes on. What is it about them that draw people in? It is what they stand for. They are good for the sake of goodness. I was reading some old comics to clear my head when in New Avengers 15, I saw Carol Danvers’s description of Captain America. How do you represent an ideal without becoming arrogant and self-righteous? Is it possible without burning out? My personality type centers on idealism. I went in depth on that in the My Purpose and What Are You Made of posts. It also makes my pet sin to be self-righteousness. I face these important battles. The days before I planned to write this, I came across an article in my Twitter feed. Chris Railey titled it The Shape of Leadership. He was facing burn out, too. The fire was lit and he questioned God about it. The answer would be a blow to anyone driven by ego. I can take a hint. It is a long in-depth article that I encourage you to read. In it, he touches on the two traits that the best leaders have. That sounds like Captain America to me. It sounds like someone else, too — Jesus. He didn’t look for personal gain or success. He put his mission and people first. When you change success from a big picture perspective to a small moment’s perspective, it gets easier. Instead of worrying about the results, ask yourself three questions. Did I love them as Jesus would? Did I do anything Jesus wouldn’t be proud of? Are things better now than they were before? When you make it about others your focus changes. The ego isn’t involved anymore and you get out of your own way. When you represent Jesus, it is no longer an issue about your reputation, but His. With the first, you retain your humanity. With the second, you retain your humility.